time tested recipe for success. The first ingredient in the owl’s hunting strategy is its location. Perched high above the ground, it has the best possible chance to see any prey animals in the vicinity. The second is its voice. 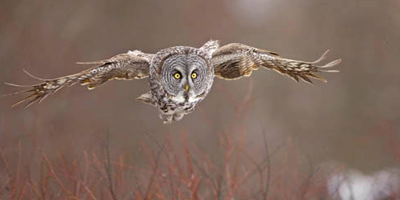 The iconic hooting of owls is not simply a thrilling noise they make, it is an effective hunting tool. At night, to a rodent hiding on the ground, under a bush, it is very hard to pinpoint the location of the noise which seems to come from several directions at once. The owls use their voice strategically, calling and then pausing and then calling again. The goal of their calling pattern is to make the prey think they need to find a better hiding spot. When they move, they are playing right into the trap. Owl eyes are made to see at night. They are especially sensitive to movement, and can pick up even the slight shifting of rodents nearby. Once they have called, and forced the movement of their prey, it is up to these eyes to spot it. Once the prey is spotted, the owl goes into stealth mode. Relative to most birds their size, owls are not especially strong fliers. They have sacrificed some of the rigidity in their feathers, even the flight feathers, in favor of silence. The softer, more flexible feathers may not be able to carry the owl as far or as fast as many other raptors, but they can launch an owl into a flying attack with very little noise. Like all raptors, owls have large, powerful talons. Once they hit their prey, the talons quickly dispatch it. Owls either swallow their prey whole, or if the rodent is too big, they will tear it into chunks to eat it.